This is where Arbitrage Funds come into picture. Arbitrage is the price difference between the Cash Market and Derivatives Market due to Market inefficiencies. Here, the Fund buys ACC @ 980 in NSE cash and sell in BSE @ 990 and the resultant difference is the profit. In Scenario 2, the Fund sells ACC at 995 in F&O and buys at Rs.980 in NSE cash. So, on Expiry day (settlement date), the fund has made risk free profit, because the Cash price and F&O tends to coincide. This Arbitrage (price difference) could be due to multiple factors like Dividend payout, rights issue, Buy back,etc. 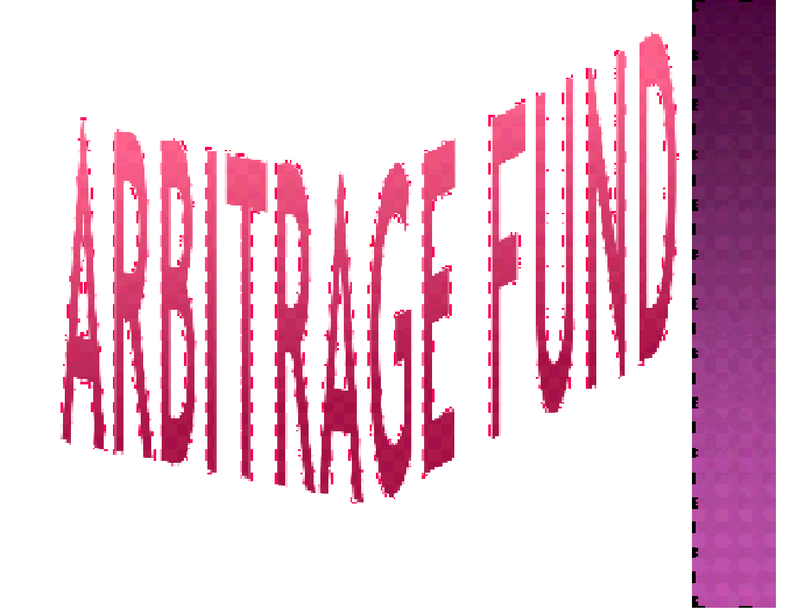 Arbitrage Fund is the fund which is designed to capatilise on this mispricing and generate returns. 1 1. Tax treatment like Equity funds without the risk associated with Equity. 4 4. Very little chance of “negative” returns as evidenced by the returns seen in 2008, where all kinds of Equity funds gave Negative returns, but bucking the trend, Arbitrage funds gave positive returns. 5 5. Arbitrage Funds tones down an investors risk. 6 6. Dividend recd from Arbitrage Funds are TAX FREE. 7 7. Acts as an “hedge” against volatility. 1 1. In a falling interest scenario, Debt funds can easily outperform Arbitrage funds by a wide margin. 2 2. Only in a volatile market with its attendant fluctuations, arbitrage opportunities are created and hence in a flattish and stable markets, the Arbitrage funds tend to underperform. 3 3. Fund Manager has to be extra vigiliant to spot and grab opportunities whenever they arise. Failing which, the returns are affected. 4 4. Since Arbitrage Funds tend to have large number of transactions, the result is the rise in cost of managing funds due to Brokerage and Security Transaction Tax (STT). 5 5. Arbitrage Funds tend to have a higher Exit Load compared to Debt Funds. 6 6. Even Expense Ratio is almost always higher in an arbitrage fund compared to Debt fund. 7 7. Arbitrage Funds are not allowed to “SHORT” in Cash Markets, hence in a Bearish market, their performance can suffer. WHO SHOULD INVEST IN THESE FUNDS?? 2 2. An investor who has booked profit/recd a huge lumpsum but does not know where to invest can consider Arbitrage Funds till he finalises where his funds will go. 3. Uncertain markets are the ideal to lock in your funds in Arbitrage funds. 4 4. Those who have retired or taken VRS, can keep their corpus in Arbitrage funds (instead of Debt funds) and do a Systematic Withdrawal Plan to not only earn Tax Efficient returns but also Debt Fund returns. 5 5. An investor who is overexposed to Equities, but prefer better than Liquid fund return, can go for Arbitrage funds. Investors are also cautioned to take note that besides Arbitrage Funds, there is a similar sounding Arbitrage Plus Fund. These Arbitrage Plus funds carry a higher risk cause they can take even Unhedged positions whereas a Pure Arbitrage Fund always has its position Hedged. Due to multiple trades, high brokerage charges are paid by these funds in addition to STT, hence a High AUM would help the fund in spreading the cost and reducing the overall Expense. In a rising Interest rates scenario, Debt funds including FMPs would do better than Arbitrage funds and hence it does not make sense to invest in Arbitrage funds at those times. Likewise, in a Rising markets, investing in a Diversified fund would be a much better option. So, if you are investor, who wants a Risk-free Tax efficient fund and are unsure of the markets in present condition, you can invest in Arbitrage Funds and do a STP into a Diversified Equity Fund. If your investment horizon is more than 1 year but less than 3 years, you can consider Arbitrage funds, but if your investment horizon is less than 1 year, you can look at Liquid/Debt funds. PLEASE NOTE, ARBITRAGE FUNDS ARE GOOD FOR SHORT TO SHORTISH MEDIUM TERM, THEY ARE GOOD AT PROTECTING YOUR MONEY BUT THEY DO NOT (I REPEAT, DO NOT) CREATE WEALTH. Arbitrage Funds is a risk mitigating tool. Every investor should have 1 Arbitrage Fund in his/her portfolio.